Arthritis causes inflammation in one or more of your joints. Many of the different types of arthritis can happen in your feet and ankles, often making it difficult to walk and do the things you enjoy. How do I know if I have arthritis in my feet or ankles? 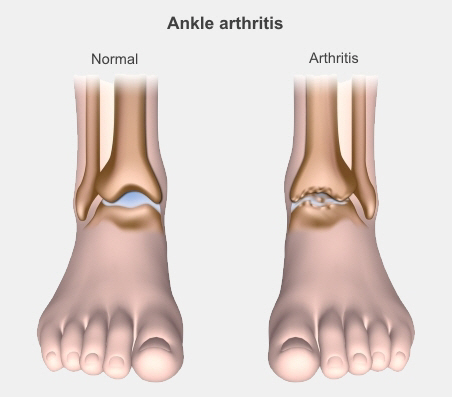 To diagnose arthritis in your ankles or feet your doctor, physiotherapist, or podiatrist will examine your feet or ankles and ask you questions about the pain, how bad it is, and how it affects you. You will also have an X-ray to show exactly where the arthritis is and how bad it is. Septic arthritis is a very painful joint infection that needs urgent medical attention. if you have sudden swelling of a joint, severe joint pain, redness and heat around the joint, a fever, or are generally feeling unwell, see a doctor as soon as possible. Several conditions can increase your risk of getting arthritis. However, it is most often caused by having a previously broken ankle bone, or some other ankle injury.